According to latest forecasts from Mediacells, consumers in India and China alone will buy almost 600m smartphones in 2014, comprising half of the global total. Smartphone penetration will grow fastest in China, India, Vietnam and Indonesia where half a billion new users will be added in 2014. In line with bulk sales, China and India will add 216m and 207m new smartphone users in 2014. 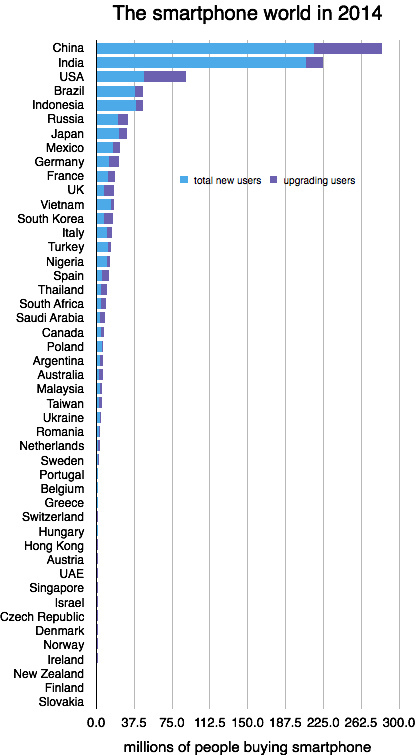 But the really stand out markets are Indonesia, who will add 40m smartphone users, and Vietnam who will see 14m more smartphone users by the end of 2014. This means more than 80% of new smartphones will go to first time users in Vietnam and Indonesia over 2014. The year ahead is looking to be a real tipping point for mobile in the region. Mobile is now reaching the stage in Asia where it cannot be ignored from an advertising and marketing perspective. It will be interesting to see whether this is reflected in increased Mobile spend from brands and advertisers over 2014.